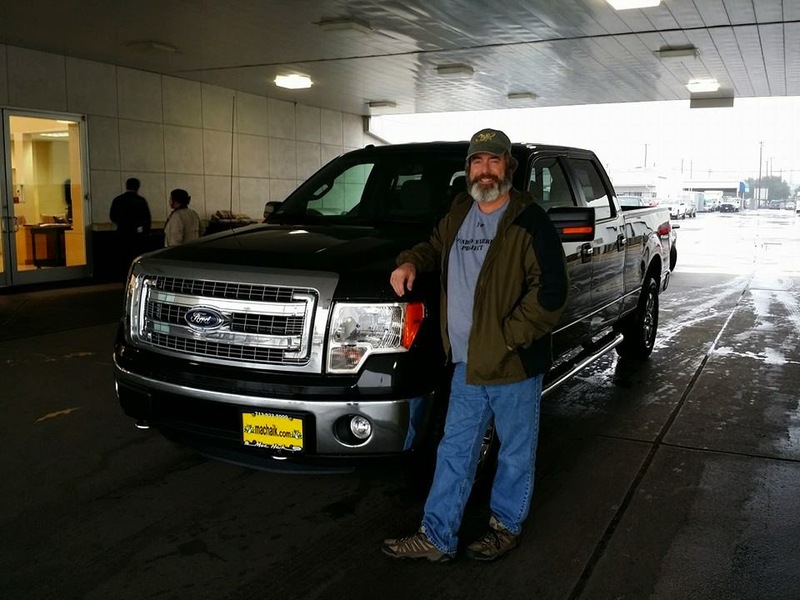 On 1/1/15 I picked up a new Ford F-150 XLT 4x4 with the eco boost engine. Now I just need a trip to the bend to so I can post pics of it in the Your ride in the bend thread. How does it compare to a Raptor? a LOT easier on the wallet for sure ... I did not even consider a raptor, I was gonna go with the FX4 package, but saved my self a ton of money by going with a stripped down XLT model. Stingrey said he test drove the raptor a few months back and said he did not like it. He said he was disappointed in it as he was really excited about it based on reviews and stuff. Said he did not like the way it handled. If I did a LOT more and I mean a LOT more off roading, something like the FX4 would be the best option, and since I may get off road only a few times a year, something a bit easier n the wallet was in store. Sweet truck and nice beard. You are Big Bend ready..
Nice truck James, I'm doing a little research now myself to upgrade my 2wd f150. Now you need to pick up Rey , get out there and get busy. I have a '13 XLT SuperCrew 4x4. For me, it has become the perfect Big Bend vehicle. Congrats! I almost went with an FX4 or similar myself. I had a 2006 Ranger Sport with only 170K miles on it. You'll love the Ecoboost. The hardest thing about driving one is resisting the temptation of burn rubber! steelfrog, I did in fact drive the Raptor... And I was already approved and ready to pull the trigger when I went in to drive it... I am not saying that it is not a great ride for what it is capable of, but for how it drove as a daily driver, I felt it was very "floaty". That soft off road suspension was not ideal when switching lanes in traffic, etc. Well, not for me anyway. I like a tighter handling vehicle, although a truck is not the first choice when it comes to having sportscar like handling. THEN there was the price. The price is definitely an issue depending on what you're targeting. I personally was not scared by the price on the used version I was looking at, but I DID feel like the price was a bit off when I sat inside and looked at the somewhat dated looking gauges and I just couldn't move past that (again, I was looking at used). Fast forward a month or so and it turns out I knew someone who already had a 2014 Ram Ecodiesel which at the moment had become my main focus. He let me drive his truck and explained that the 2014 Ecoboost (F150) was what he WOULD have gotten if he didn't drive so much. His description of the F150 made me wonder if it was different from the Raptor rendition of the truck. When my wife basically said "WOW" when we opened the doors on the one we would end up buying, that said a lot to me. The 2014s can be had at a pretty considerable discount with the '15s which are hitting showrooms now. My version has the 4x4 option, and for starters the F150 with basic 4x4 factory shoes did AWESOME off road. Mind you I only took Glenn Springs rd. to Pine Canyon, but man was it fun! Anyone who knows me also knows that I have a weakness for vehicles. By default I've never been a truck guy... At all... But I have to admit, this is one that WILL stay in the stable as the years go by. It is as pleasurable to drive as it is comforting to use as intended. Towing, the v6 Ecoboost has LOADS of power. Up/down hills with the towing package is a joy since the speed is moderated both ways. The wind on the way to the park was so horrendous a weekend ago that the anti sway built into the system kicked in and auto braked the trailer the moment when I realized something was about to become unpleasant. Point is it has power AND brains. Driving, the large vehicle is predictable and definitely comfortable. I only regret having gotten the truck in black as it is larger than most vehicles I've had, so I dread the day I pick up a door ding or desert pinstriping. Definitely a big congrats to you James! I hope we both get some great years of service out of these rides. I've gotta say, I truly miss the Trailblazer as well! I'm pretty sure that you'll dig your new ride out there in the park though! Side note, maybe we should all get our trucks out there at some point sorta like how the other car clubs do now and again! I didn't realize it, but a good number of us happen to have F150s that are begging to be lined up and photographed out in BBNP! Rey--does any stock vehicle beat a Rubicon for off roaring?